Leaves: Alternate, sessile, thick, often round in cross section; blade lanceolate to elliptic or oblong, .1 to .5 inch long, .06 to .07 inch wide. Inflorescences: Terminal or axillary, usually cymes, sometimes spikes or thyrses, usually secund, with 2-7 radiating, +/- horizontal branches. Flowers: Bisexual, radially symmetric; sepals 4-7, yellowish green, oblong to triangular, .02 to .1 inch long, .02 to .06 inch wide; petals 4-7, yellow, distinct or slightly connate basally, lanceolate, .08 to .16 inch; scale-like nectar glands present; stamens 8(-14), those directly in front of petals usually adnate to bases of petals; anthers yellow; pistils 4-7, distinct; style 1 per pistil; stigma 1 per pistil. Fruits: Follicles, nearly perpendicular to pedicel at maturity, .1 to .2 inch; style .02 to .04 inch; seeds 1-30+ per carpel, oblong-ellipsoid, ca .02 inch. Comments: Plants pale green, succulent. Sedum, to sit, alluding to the habit, and nuttallii, for botanist and naturalist Thomas Nuttall. 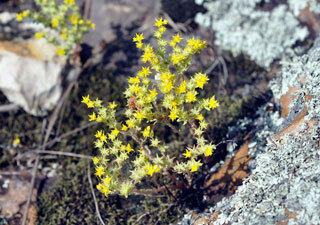 Sedum nuttallii Torr. & E. James is an older name than S. nuttallianum Raf. ; the latter is used for this species in much of the older literature.